I somehow neglected to post notes on this one. I really enjoyed the 2007; the 2008 was also solid. In the glass we have a clear, light-plus lemon-gold. The nose is, if I recall past vintages correctly, a bit of a departure from the Joie style: this seems to have a bit more of a European Riesling quality, more mineral, a bit of floral, and some citrus qualities, clean and medium intensity. Palate is off-dry, high acidity, and medium body. Honey and apricot, grapefruit, and a touch of an earthy-slate quality. Medium length with the sweetness and citrus dominating. 11% alcohol. It is straightforward, but very enjoyable; I think this is probably their best Riesling to date. Recommended. $27 at Crosstown. See Joie Farms (warning: Flash, so won’t work on iPad; and required an upgrade the latest version for some reason, but still wouldn’t work in Safari—Joie, please do an HTML site!). Clear, medium gold in the glass. 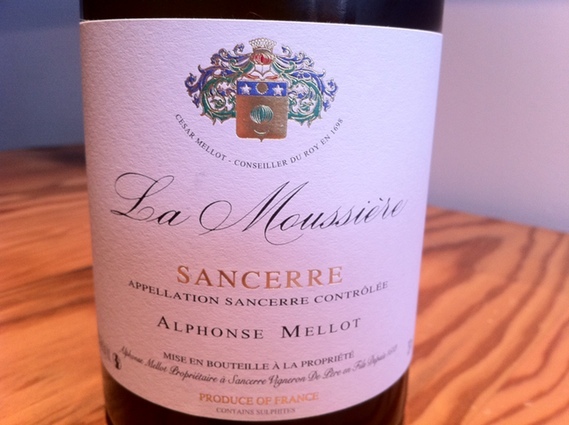 Clean, appealing medium intensity green apple-pear nose with floral and spice notes. Dry, high acidity and light-plus body; nicely balanced lemon, grapefruit, and a sharp minerality. Medium length; 12.5% alcohol. Recommended. $33.90 at Marquis. See Les vins du Domain Pellé. I’m on an NZ Sauv Blanc kick. This one is a a clear, almost-medium gold. Clean, medium intensity deep ripe tropical fruit along with a strong green pepper-vegetal nose that’s very appealing. Dry, high acidity and a medium-plus body. Spice, melon, very ripe pear and grapefruit, along with the green pepper on the palate. Medium length; 13% alcohol. I like the complexities here; it’s similar in many ways to the 2008 Kato. $22.90 at Crosstown. See Otu Wine (the site was down when I wrote this review). Clear, light gold in the glass. Clean, medium-plus intensity melon, citrus, and mineral nose. Dry with a hint of residual sugar probably coming from tropical fruit notes. Strong lemon quality. High acidity, though it seems to drop off quite quickly in the finish. Medium body. Seems to be some use of oak here as well—comes through in the nose a bit too. 13% alcohol. Good length. Quite enjoyable, though there’s something about the dulled finish which doesn’t quite satisfy; overall good. See Alphonse Mellot Domaine Moussière. Clear, pale silver-gold appearance. Clean, medium intensity nose of honey, petrol, and spice. Almost medium sweet, straightforward apricot, honey, and slate on the palate. Medium body and length; high acidity. 8% alcohol. Overall good; a bit one-dimensional. $26.50 at Crosstown. See Reichsrat von Buhl.